Alpe d'Huez, Oz, Vaujany, Auris & VR 2018-19. Happy days. 30cm at least in resort! Une perturbation débarque sur le département ce mardi dans la soirée. La limite pluie-neige s'abaissera progressivement vers 300/500 mètres. Les chutes de neige se maintiendront sur les reliefs jusqu'en fin de nuit/début de matinée de mercredi. The resort pistes are at their best at the moment. Great surfaces, relatively few skiers and, today at least, excellent weather. A treat. Just woke up to 10-15cm in Bourg! You know things are serious when the workers bus has snow chains on! Snow forecast for the next day, rising snow level to around 1500m. 30-40cm forecast. The storm is giving as hoped. Very heavy snow with a lowering snow level. Not a lot open due to avalanche risk. 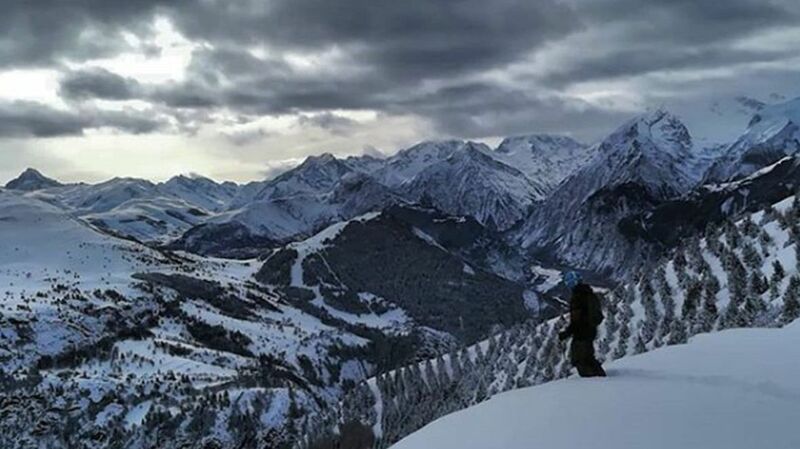 The CRS des Alpes de Grenoble, a mountain rescue unit, is launching a call for witnesses as part of an open investigation following the worrying disappearance of a skier on the ski area of ​​Alpe d'Huez sector "Le Signal - Grande Sure ", Massif des Grandes Rousses. It occured the day of Thursday 31 January 2019. The young man of 18 years old, student, from Bourg d'Oisans (3 , took the chairlift of the Grande Sure at 14:26 to go down in the valley on the hamlet of Rafour in Bourg d'Oisans passing maybe by the hamlet of Sardonne in the town of Oz en Oisans. He is called Sacha ARABADZIC, born August 2, 2000 in Saint-Martin d'Hères, residing: Rafour - 38520 LE BOURG D'OISANS. He is 1.75 m tall, of slim build, brown hair, green eyes. At the time of his disappearance, he was dressed in khaki mottled pants, a black "Ski Club Vaujany" screen-printed jacket, and a blue ski helmet. His skis are brand Dynastar Fat yellow and blue, Nordica Doberman brand ski boots black. Anyone who has crossed his path or likely to provide us with information is asked to contact the CRS of the Alps of Grenoble at 04.76.84.70.46. Can only fear the worst with conditions as bad as they are. What route would he have been taking ? Rafour is nearer Allemont than Bourg d'Osans ? I have ridden that way on a bike in the summer but by traversing back from Sardonne as I remember and you are in forest for most of it ? Yes, pretty sure that is the bike track, or close to it anyway, that I was thinking of. I've skied that route a number of years ago with a guide. He took us there because it was snowing heavily that day with poor visibility and it was deemed a relatively safe option. On the day we were there we took care on the top open section but once in the trees it seemed safe as you are on a trail. At the bottom it opens out into shallow powder fields. Very sad situation. Quite a few cars and busses struggling on road up to resort and having to put snow chains on. Another 20-30cm due in the next 24 hours. Should be great for the start of the school holoidays next weekend. 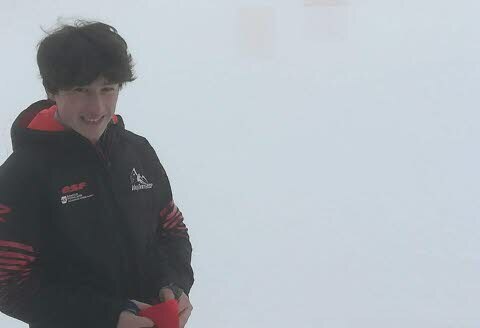 The search for Sacha has resumed properly this morning after the mountain rescue nearly got caught in an avalanche themselves over the weekend. They've brought in Recco gear and a helicopter - the Recco receivers can detect mobile phones etc. This haunting last photo was posted on Instagram just before the young skier's disappearance. It shows him just above Villard Reculas with the combe du Bras in the foreground (you can see the tree plantations as you drive into ADH). 1.50 meters of new snow has fallen in the area since last week. Had a ski today on my day off. Fantastic piste conditions on a beautiful sunny day. Absolutely perfect conditions this week, loads of snow when we arrived at the weekend followed by sunshine, having a great week. Apart from the heavy handed lifties when the Folie closed on Monday, and the complete carnage, we won’t be going there again, completely different experience to 2 years ago. Is that the Folie or Alpe d'Huez ? What did they do ? We met our friends at the folie, they’re beginners so wanted to take the chair down but the lifties said no you Ski! They explained they aren’t capable of skiing down but basically told tough! You can’t take skis on the chair down, we could 2 years ago hence why I suggested it. We had to ski down carrying their skis so they could take the chair. There was a young girl, very drunk also wanting to take the chair down, a liftie guy pushed her hard out of the way, she then tried again and a female liftie just shoved her so hard to the ground, the folie closed at 4.30 and the staff were so rude, leave now we are closed! There were so many drunken people being made to ski ax they wasn’t allowed to take the chair, I’ve never witnessed anything like it! The folie was fun until 4.30 bang on, then it was leave now we are closed, staff were so rude, apparently there’s new management? I’d never go again nor suggest it to others. Just seems madness to me! To be honest the Folie is not somewhere I would go, or have been, but that sounds bad. Unfortunately when the folie was opened the marmottes lift had been recently "upgraded" from an older bubble lift to that new chairlift. The old bubble lift used to plod on all day and downlifts were no different from uplifts, you just shoved your skis in the slot and got in, a bit of a squeeze for 4 but hey, all part of the fun. The new chairlift appears to have not been properly designed for lots of downlifting in that, despite it being modern demountable, the whole thing has to be slowed down for people to get on and off, either with their skis on their lap or on the chair behind. It then takes some time to pick up speed again, and if there are lots of people downloading from the folie as soon as it reaches speed it slows down again. So presumably that's why they were "discouraging" downlifts. None of this excuses treating people like you have described but I think the root cause is the wrong type of lift serves the Folie, should be a walk-in bubble. Arriving in Vaujany this weekend, woohoo! Looks like Sunday will be spent higher up and Monday down amongst the trees on the Oz-Vaujany side, given the forecast. Any local tips for good side-piste spots on the Monday in that area? It looks snowy and blowy with a hefty wodge of windchill, so will aim to entertain the kids (son finished ESF Gold last year, daughter doing Gold this year) in the fresh snow. @feefee, I ski almost exclusively in France so obviously enjoy it but that does sound typically French. I don't really understand the logic of having a big party bar up on the mountain and the inherent dangers of people skiing down from it. Surely better to have somewhere at the bottom of the slopes. And of course at 4.30 things would just be getting started. Note: I go to ski and not drink/party so it clearly I am not the customer base! @Arno As you say, all part of what makes it fun. They've had the skiers code drilled into them and when we go 'wandering' they know not to stray and understand what they're getting into. My wife and I tend lead and tail them through new territory until we're comfortable letting them take the lead. Really appreciate the advice and looking forward to having fun with them. I second Arno's observations. There are a few bands of rock that are high enough to pose problems. I'd stay closer to the path of the Montfrais chair to begin with, the terrain gets wilder the further to the left you go (form the bottom of the chair). If there is enough snow, going on the valley side of the Edelweiss run there is an old itineraire called Roche Melon. My kids have had a few adventures to the left of the Chalets. Mainly harmless. Have a great week. Apart from the off piste discussed above where are the best tree lined runs? In the Oz Vaujany sector all the runs below 2000m are treelined. The Auris sector has plenty of trees too. Not many trees in Alpe itself though. The bottom section of Sarenne is a tree lined gorge, very lovely, but you get there by skiing down a long barren valley from 3000m or higher so not really what you are asking for I think. Best tree run imo is La Foret, which is an itinerary surprisingly sparsely populated with trees given the name but which is steep and deep, with the added bonus of ending by La Bergerie, the best restaurant on the mountain. It is in Villard Reculas. The best tree lined pistes are La Fare, Edelweiss and Vaujaniate. Enjoy what looks like it’s going to be a good week. Petere, thanks a million. The mix and suggestions are perfect. We have our young family with us so some of those runs sound perfect. We also have our friends with us for when the kids are in lessons, so the itinerary sound perfect. Snow has stopped, blue sky appearing. A lovely week ahead. Can’t believe how warm adh has been in the last 2 days , tee shirt weather . Lift queues are not that bad , 10 mins the worst at marmottes. Skied livre Blanc and the reds off the top of Les Jeux which were in superb condition and not too busy for half term . If your coming to resort this week you won’t be disappointed but you will be hot ! Resort busy with the school holidays. Les Bergers car park now being taken over by one of the Tomorrowland stages. Anyone going to Tomorrowland? I'm there with a group of mates and staying in Oz.